It’s the kind of moment you wait for on the red carpet. Lady Gaga wrapped up her incredible Awards Season in one of the largest yellow diamonds in the world. 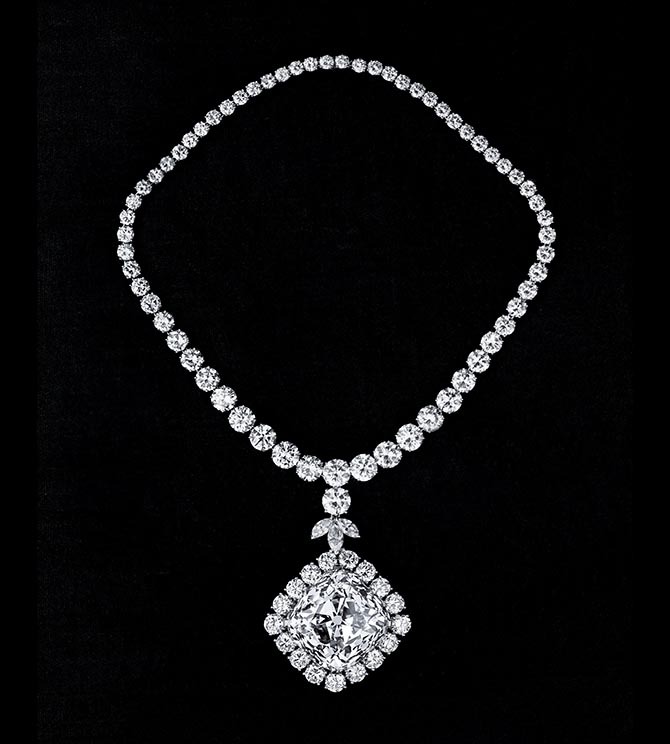 The 128.54-carats Tiffany Diamond formed the pendant of her diamond necklace. 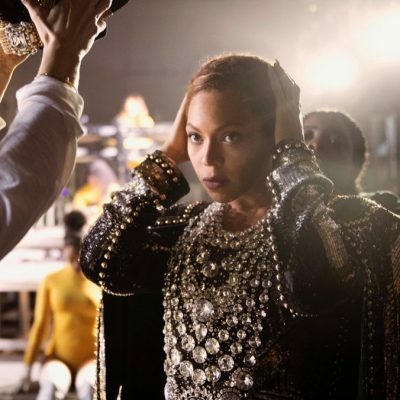 Customized to fit Lady Gaga, the jewel was based on a piece created for the Tiffany diamond in 2012 to celebrate the 175th Anniversary of the firm. “Lady Gaga is the ultimate creator, innovator and rule breaker, and I’m thrilled that she will be wearing the legendary Tiffany Diamond on the awards show red carpet for the first time since it was discovered 141 years ago” said Reed Krakoff, Tiffany & Co. Audrey Hepburn last wore the Tiffany Diamond in a necklace for the Breakfast at Tiffany’s publicity photo shoot. 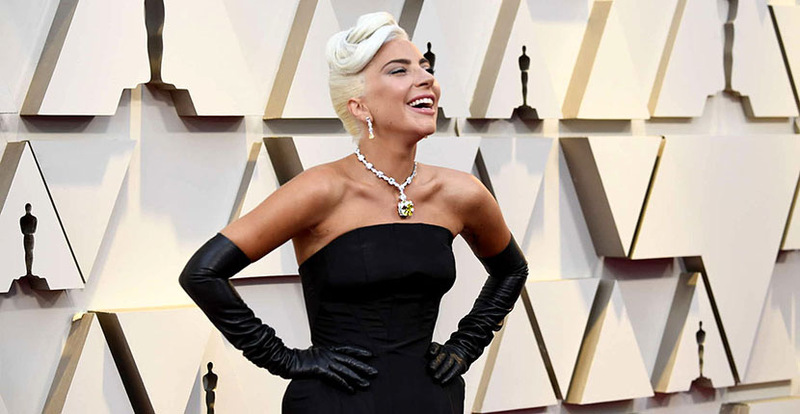 Lady Gaga paired the necklace with an Alexander McQueen black strapless dress and gloves reminiscent of the famous Givenchy gown worn by Audrey in the beloved movie. Gaga also wore yellow and white diamond and platinum earrings that echoed the design of the necklace. If the Hope Diamond is the dark and mysterious gem of the mineral world, the Tiffany Diamond is all sunshine, sweetness and light. The gem is priceless, because it is not, and never will be, for sale. 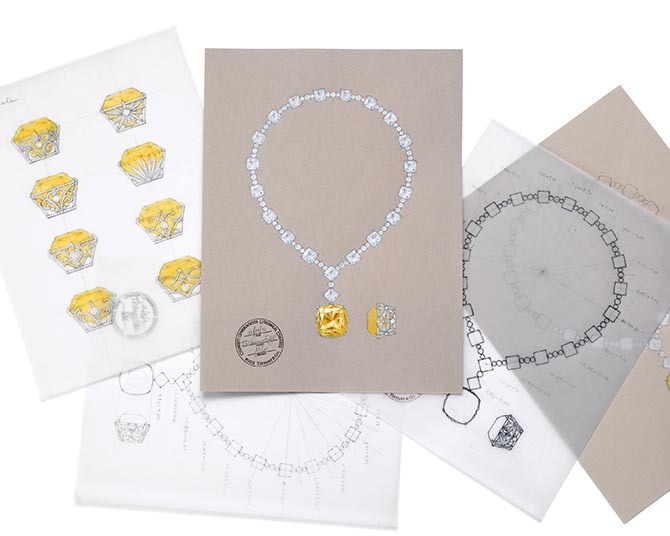 It is part of Tiffany’s Archive Collection and has a history that dates back to the early days of the firm. Discovered in 1877 in South Africa, the 287.42-carat rough stone was purchased by Tiffany’s founder Charles Lewis Tiffany for $18,000. He sent his chief gemologist George Frederic Kunz to Paris with the diamond to oversee the cutting which took a year. The gem was fashioned into a cushion-shape brilliant weighing 128.54-carats with 82 facets. That’s 24 more facets than the traditional brilliant-cut. 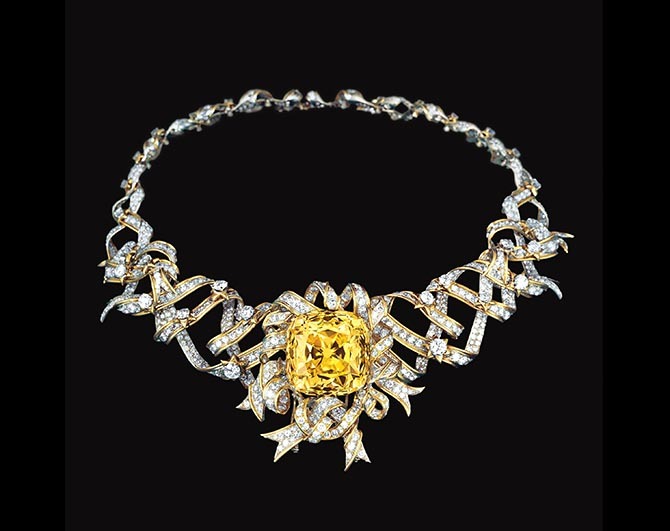 In a truly grand decision and visionary move in a period when only royalty owned big stones, Charles Lewis Tiffany named the yellow diamond after himself. Then he generously decided not to sell his gem, but to share it with the public, putting the diamond on display in his store for all to enjoy. 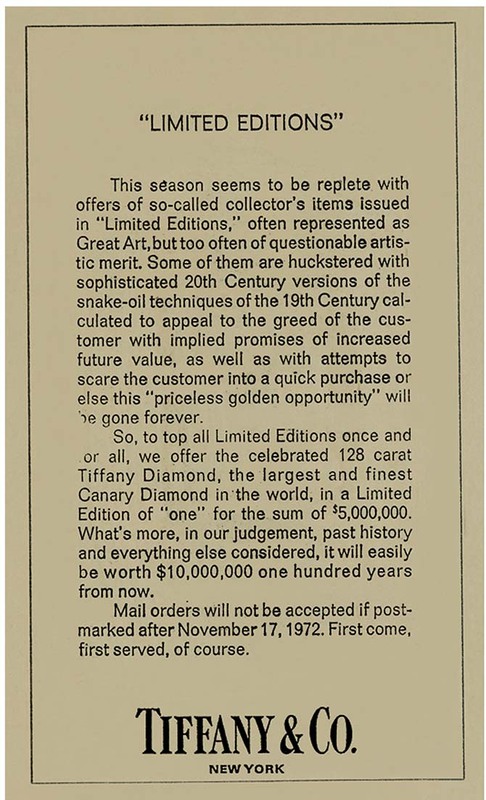 It was a contributing factor to the press nicknaming Mr. Tiffany, “the King of Diamonds.” Despite the fact that there is a turn of the century design for a jewel featuring the diamond in the archives, there is no evidence it was made. 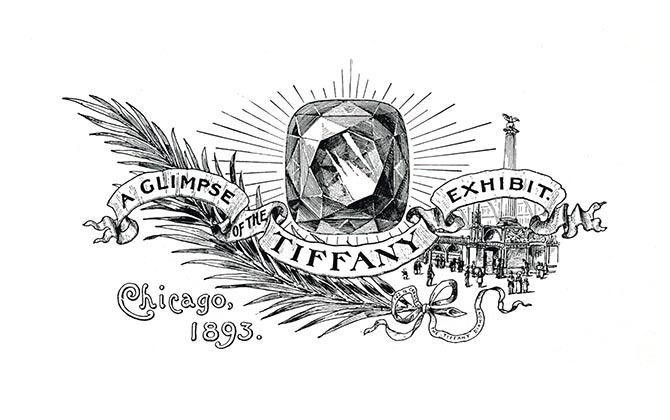 The Tiffany Diamond became an ambassador of sorts for Tiffany at international exhibitions where it garnered loads of attention and clearly announced Tiffany was a diamond authority. At the 1939 World’s Fair in New York, the Tiffany Diamond was the centerpiece of a display of diamonds laid out to look like a firework exploding or a large fountain spouting water. 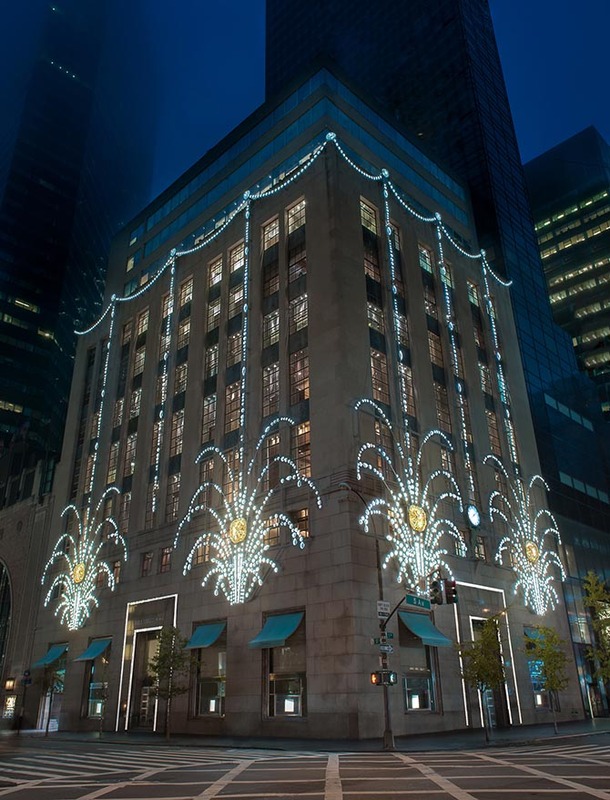 The pattern is replicated in lights every holiday season on the sides of the flagship store on Fifth Avenue in New York. 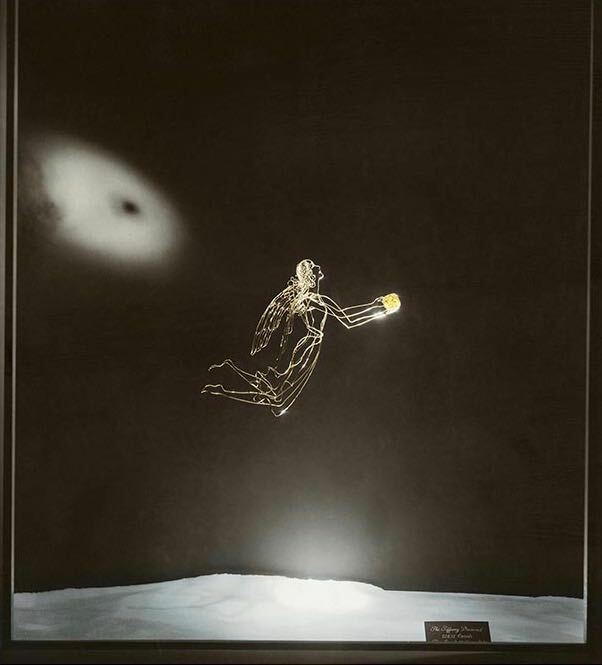 In 1955, Tiffany’s celebrated window designer, Gene Moore, put the diamond in the hands of a gold wire angel sculpture in his holiday window display. The light of the stone reportedly sparkled so brightly that passersby on the opposite side of Fifth Avenue could see it. When French designer Jean Schlumberger began his career at the American jeweler in 1956, one of the first things he did was imagine how he would mount the Tiffany Diamond. His “Wardrobe of Settings” was published in the November 15, 1956 issue of Vogue along with a photo of the stone by Irving Penn. 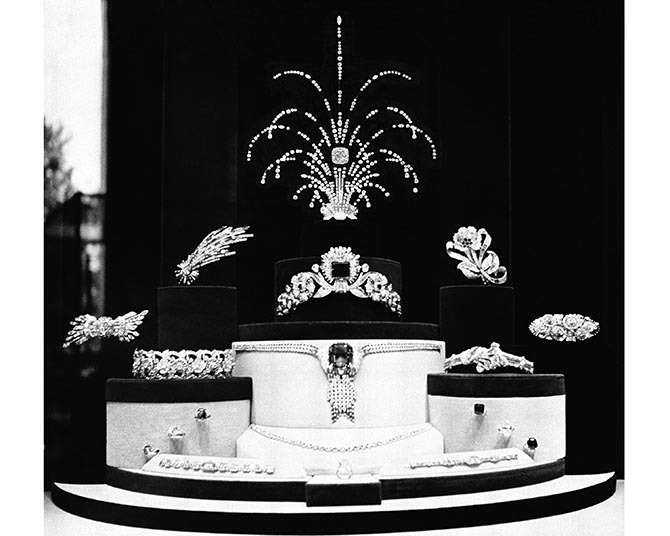 The story said, “Jean Schlumberger, the brilliant young jewelry designer for Tiffany’s, studied it with fascination for months; finally had the idea of designing a ‘wardrobe’ of three settings in which the great canary diamond might be worn interchangeably.” None of the jewels were made at the time. 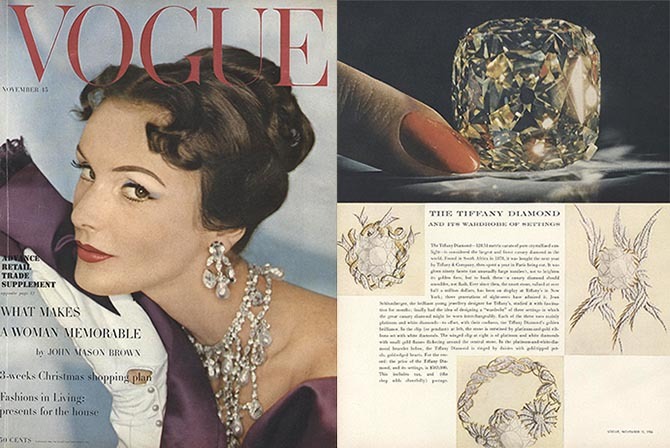 The first time the Tiffany Diamond was ever set in a jewel was for the 1957 Tiffany Feather Ball. It was mounted in a simple frame of diamonds suspended at an angle from a round diamond necklace. The piece was worn by Mrs. Mary Whitehouse. If you are thinking, well, that seems sort of random. It kind of was, but it was also a reflection of Tiffany’s long running support of charitable causes. The event raised money for the Preservation Society of Newport to help restore deteriorated 17th and 18th century buildings in the area. Other notables in attendance were a young senator named John F. Kennedy and his wife Jackie. Now, if you are thinking not putting the piece on the future First Lady was a missed opportunity. It kind of was, but who knew what a style icon she would become. In 1961 the Tiffany Diamond made a brief appearance in Breakfast at Tiffany’s mounted in Schlumberger’s Ribbon Rosette necklace. 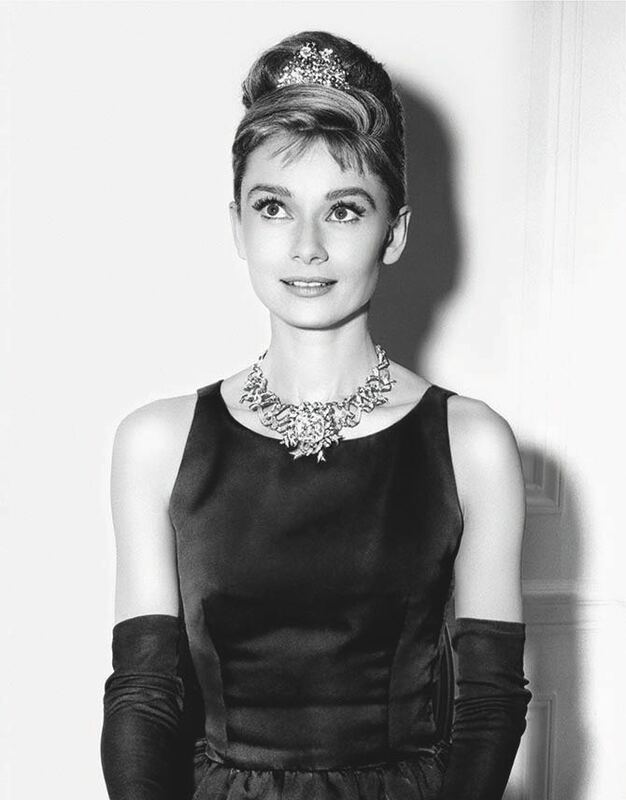 When Audrey Hepburn and George Peppard enter the Fifth Avenue flagship, she off-handedly remarks that she “doesn’t give a hoot about jewelry except diamonds,” looks down into a display case and adds “like that!” The “that” she is referring to is the Tiffany Diamond. 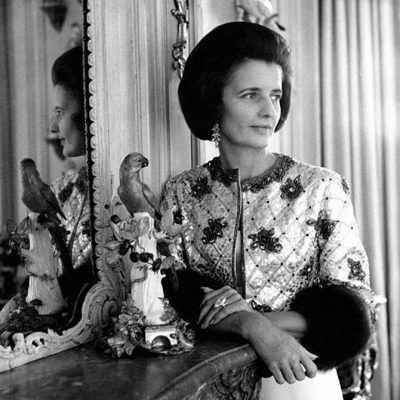 Hepburn did not wear the jewel in the film, but she did pose in the piece for publicity images. The centerpiece of Schlumberger’s Ribbon Rosette necklace seen in Breakfast at Tiffany’s is one of the original brooches the designer conceived for his “Wardrobe of Settings.” For the necklace, the brooch was turned around with ends of the ribbon pointing down. In the Vogue item, it is shown with the ribbons up. Incredibly sculptural, the curvaceous ribbons in the design suggest movement. They are made of white diamonds, yellow gold and platinum. 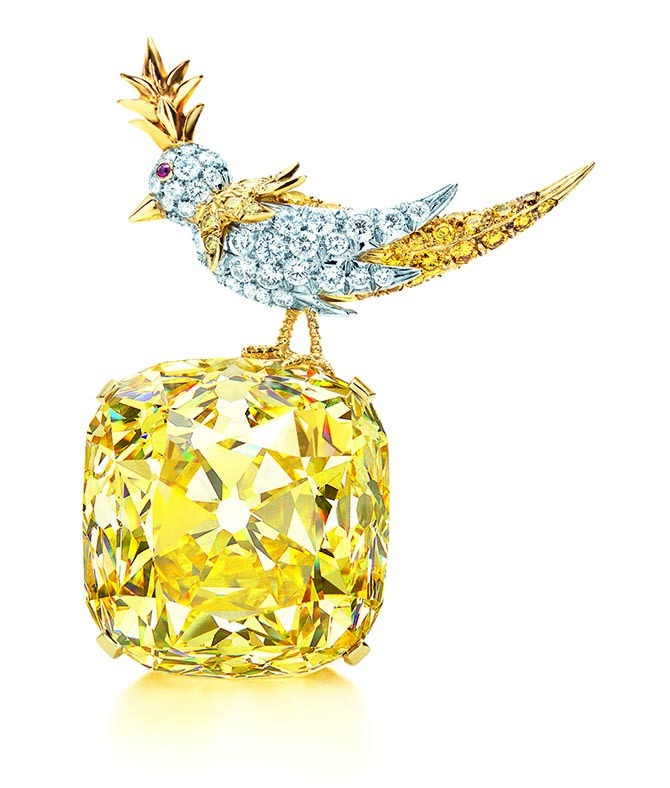 For Schlumberger’s retrospective at the Museé des Art Décoratifs in 1995, staged eight years after the designer died, the Tiffany Diamond was set in one of designer’s most delightful creations, a brooch titled, “Bird On A Rock.” The little creature perched on the corner of the big gem proved to be so popular, Tiffany kept it in the setting for many years. It was a fitting tribute to Schlumberger who clearly would have loved the diamond. 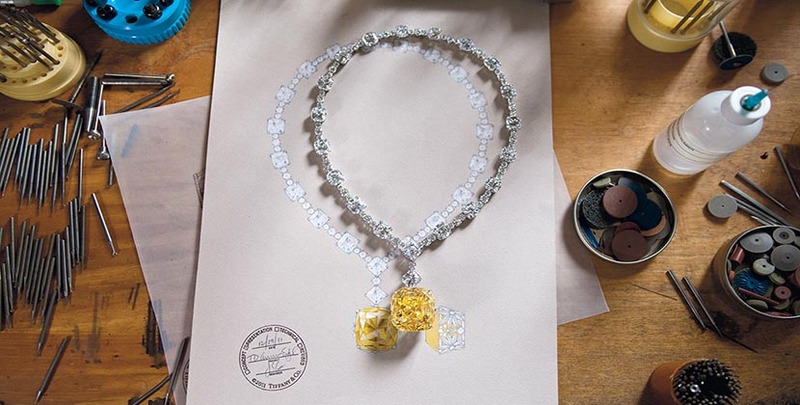 In celebration of Tiffany’s 175th Anniversary in 2012, the Tiffany Diamond was set in an astonishing diamond necklace with over 100-carats of gems. 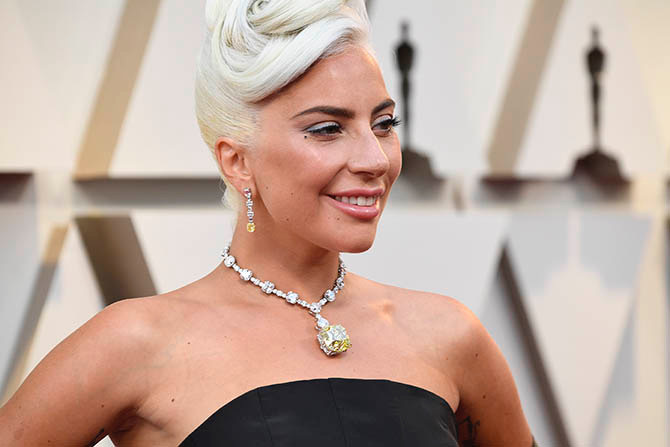 The necklace was modified for Lady Gaga to wear to the 2019 Oscars. 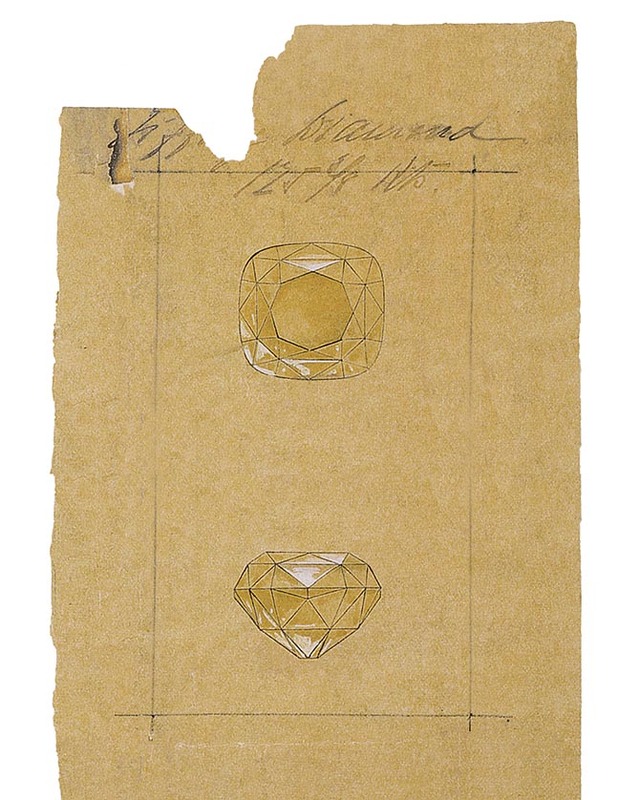 The Tiffany Diamond has long been a source of inspiration for the creative teams at Tiffany. It has provided the starting point for jewelry collections and design motifs. The shape of the gem is part of the shapes found on the elegant bottle designed for the new Tiffany signature fragrance. It is also part of the holiday décor on the Fifth Avenue flagship. The fireworks inspired by the display of the Tiffany Diamond at the 1939 New York World’s Fair light up the building for the festive season.